For the third straight year Ford has taken top honors in the Overall Loyalty to Manufacturer and Overall Loyalty to Make categories of the Polk Automotive Loyalty Awards, announced at the Automotive News World Congress in Detroit. Now in their 17th year, the awards have honored the Ford F-Series 15 years consecutively in the Mid-/Full-size Pickup category. Ford's owner loyalty apparently stems from not only quicker product updating cycles, but also an end of lease process that is customer-focused. Of course, it might have something to do with the brand's competitive product line crossing nearly all vehicle segments. 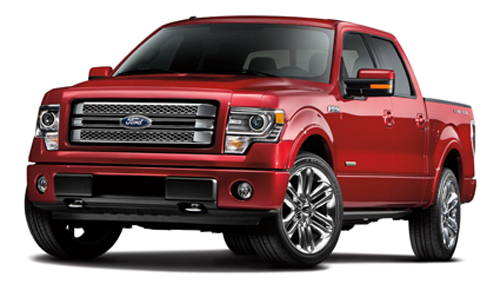 "We are honored that our customers continue to choose Ford and Lincoln products. Each day, we and our dealers strive to earn their loyalty by providing exceptional sales experiences and a great consumer value proposition driven by high fuel economy, smart technology and safety," said Ken Czubay, vice president of Marketing, Sales and Service, Ford Motor Company. In addition Volkswagen was named in the Most Improved Loyalty to Make category, a result of an emphasis on customer engagement across the term of ownership, and an aggressive vehicle pricing strategy for the US market that doesn’t compromise the brand’s product line. Honda was doubly honored with the Civic winning in the Compact Car segment and the CR-V taking the award for the Compact SUVs. "As manufacturers work to retain customers in this incredibly competitive market, we're seeing increased activity surrounding customer engagement, which is beginning to resonate with consumers," said Brad Smith, director of Polk's Loyalty Management Practice. "Our automotive OEM and agency customers are developing new loyalty programs within their organizations and as a result we're seeing increases in repurchase loyalty." Ford won again in the African-American Market Loyalty to Make category, sole possessor of the award since its inception in 2010. Honda and Toyota rounded out the ethnic loyalty honors with corresponding wins in the Hispanic Market Loyalty to Make and Asian Market Loyalty to Make categories. Ethnic buyers now represent 19 percent of all return auto consumers in 2012, according to Polk's analysis. Polk advised manufacturers succeeding in building loyalty among people of color will strengthen their position as this group increase its numbers, buying power and influence in the automotive marketplace. The Chrysler Town & Country garnered the Polk Automotive Loyalty Award in the Minivan category for its 12th consecutive time, while the Ford Mustang outperformed Dodge in the Sports Car segment once again, after a two-year hiatus. The Mercedes-Benz SL-Class was named to the Luxury Sports Car category for its very first time. The Luxury SUV segment has been the exclusive property of Land Rover Range Rover since it's inception in 2008, winning again this year. In the Luxury Car segment, the Lincoln MKZ won its second time; the Lexus RX took the Mid-/Full-size SUV category for the fourth time, while the Subaru Outback won the Mid-/Full-size Car award for the second time back-to-back. Polk keeps track of the relevant data throughout the year, providing input to the brands on effectively managing owner loyalty programs utilizing in-depth analysis of automotive shopping behaviors, market influences and developing retention strategies – for a price, of course. The data this year’s awards are based on includes over 5.9 million new vehicle owners who bought new vehicles during the 2012 model year, running from Oct. 1, 2011 through Sept. 30, 2012. "Our program is unique in the industry as it recognizes an OEM's success in its approach to customer loyalty, which is becoming more important as the dynamics of the consumer base are changing," said Smith. "OEMs are increasingly measuring store-level results as well, working with their dealers to use the metrics to improve their retail networks. They're starting to see tremendous value and business results from their loyalty programs." Not surprisingly, how long an individual owns a vehicle tends to adversely affect consumer loyalty, which peaks within three years of ownership, beginning to decline thereafter. Additionally, consumers can be swayed by the new vehicle launches of competing brands. The estimate of over 100 new vehicle launches and major refreshes in 2013 makes the chances many consumers will cross brand lines more likely. This behavior is a product of owners who choose to hang onto their vehicles longer, making them vulnerable to a great many competing commercial messages and advice. Remarkably, with the average American driving an 11-year-old car, overall owner brand loyalty for 2012 was 48.04 percent, up nearly one percentage point from 2011, according to Polk research. So which camp do you fit in – brand acolyte or model convert? Whichever you may be, the higher efficiency, lower emissions and lessened regular maintenance of most new cars make them a very attractive offer these days. Especially if the model you’re driving is getting a little long in the tooth, so to speak.